Acanthamoeba spp. are the causative agents of a severe keratitis occurring mainly in contact lens wearers. The genus comprises more than 24 species that are currently divided into 20 different genotypes (T1-T20) according to sequence variations in the 18S rRNA gene. The objective of this study was to identify the genotypes and sub-genotypes of Acanthamoeba isolates collected at the Parasitology Laboratory of the Public Health Institute of Chile, the only laboratory in the country where Acanthamoeba screening is performed. This is the first report of genotypic identification of clinical isolates of Acanthamoeba in Chile and one of the few in South America. In this study, 114 Acanthamoeba isolates from 76 Acanthamoeba keratitis patients, obtained between 2005–2016, were genotyped. T4 was the predominant genotype; T2 and T11 genotypes, which are scarcely reported worldwide, were also identified in Chilean patients (one and two patients, respectively). This is the first report of T2 and T11 genotypes isolated from Acanthamoeba keratitis patients in South America. It is also the first report of the T2 genotype circulating in this continent. Analysis of the diagnostic fragment 3 region of the 18S rRNA gene showed 24 T4 variants, with a predominance of the sub-genotype T4/A, followed by T4/B, T4/G, T4/C and T4/D. Bayesian analysis revealed three groups among the T4 variants: two well supported groups that included 12 and 7 sub-genotypes, respectively, and a weakly supported group that included 5 sub-genotypes. Most of the predominant T4 sub-genotypes belonged to the same group, which included 71.3% of the patients, while some minority variants lied mainly in the other two clusters. T2, T4 and T11 genotypes were predominantly isolated from the Acanthamoeba keratitis patients in Chile. 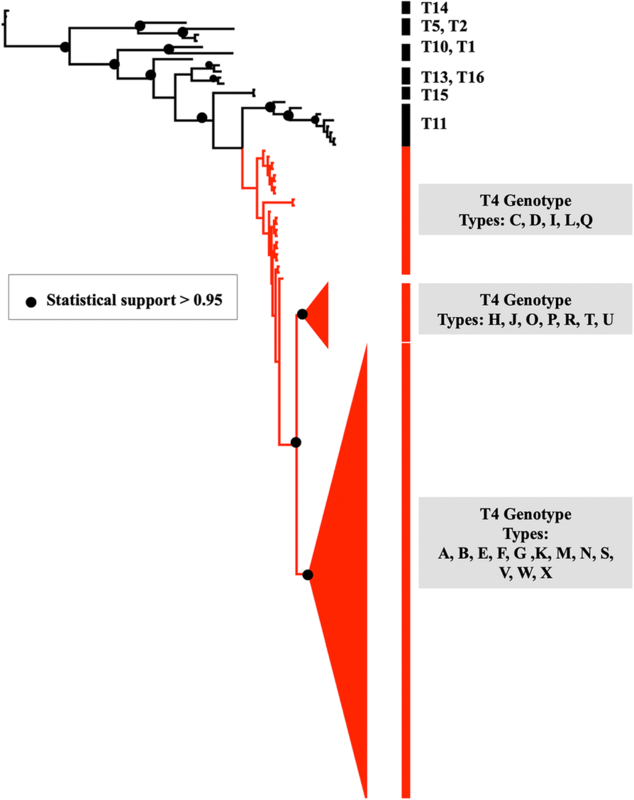 Chilean predominant T4 sub-genotypes, which have also been reported worldwide, formed a separate cluster of the minority T4 variants. This study provides useful information about the predominant genotypes and subgenotypes that would be useful in selecting suitable strains to develop immunological and/or molecular diagnostic assays in Chile. Acanthamoeba is a genus of ubiquitous free-living microorganisms that can cause Acanthamoeba keratitis (AK), a painful and severe sight threatening corneal disease. AK is especially prevalent among contact lens users, which corresponds to 85–88% of the AK cases . Since the first report of AK in 1973, the number of AK cases has increased concomitantly with the growing number of contact lens users [2, 3]. In Chile, up to 18 patients are diagnosed per year at the Public Health Institute of Chile . Acanthamoeba spp. are usually classified on the basis of the nuclear small subunit 18S ribosomal RNA full gene sequence (Rns), which allows the differentiation of Acanthamoeba spp. into 20 genotypes (T1-T20) [5–7]. Since the complete Rns gene exceeds 2000 nucleotides, a 423 to 551 bp fragment named as “Acanthamoeba specific amplimer (ASA.S1)” within the Rns gene is used for genotyping Acanthamoeba spp. . A small but highly variable region inside ASA.S1 designated as DF3 (Diagnostic Fragment 3, ≈ 240 nucleotides long) is also used to determine the genotype of an isolate . Since the vast majority of AK cases worldwide are caused by Acanthamoeba genotype T4, information below the DF3 level is sufficient to establish a sub-genotype or variant [6, 10–12]. Acanthamoeba genotyping is not only necessary for taxonomic purposes but also for epidemiological and clinical studies. It also provides valuable information for the development of new diagnostic methods, helps in selecting appropriate strains for the obtention of antigen, protein profile characterization, etc. Furthermore, it is possible to identify correlations between the isolates and clinically relevant aspects such as virulence, drug susceptibility and/or clinical outcome . All samples from patients with suspected AK in Chile are analyzed at the Public Health Institute of Chile (ISPCh). The samples are investigated by culture, and positive cultures are subjected to genotyping. The aim of the present study was to determine the prevailing genotypes of Acanthamoeba in AK infection in Chilean patients. To the best of our knowledge, this is the first study of this nature in Chile and one of the few performed in South America. The samples received for Acanthamoeba diagnosis at the ISPCh were processed as described previously . Briefly, the samples were inoculated onto 2% non-nutrient agar plates overlaid with 100 μl of a liquid culture of Escherichia coli in Page’s solution (NNA-E. coli). The plates were incubated at 37 °C for seven days and examined daily under a conventional light microscope for the presence of trophozoites and/or cyst. All positive culture plates were routinely collected in Page’s solution, subcultured in 5 ml Petri dishes with NNA overlaid with live E. coli, and also diluted 1:2 with sterile glycerol for long term storage at -20 °C. Amoebas from subculture plates were harvested and rinsed three times in phosphate-buffered saline (pH 7.4) and then transferred to Eppendorf tubes for further molecular analysis. When the genotyping service was not readily accessible, the samples were stored frozen until the service became available. At that time, an aliquot of the frozen stock was inoculated onto NNA overlaid with live E. coli until growth was observed. Then, the samples of amoeba were collected and processed for molecular analysis as described above. Acanthamoeba trophozoites and cysts were lysed by thermal shock at 56 °C for 15 min with proteinase K; DNA was then extracted using a QIAamp DNA Mini Kit ® (Qiagen, Venlo, NLD) following the manufacturer’s protocol. The ASA.S1 region in Rns was amplified using the Acanthamoeba genus-specific primers, forward JDP1 (5'-GGC CCA GAT CGT TTA CCG TGA A-3') and reverse JDP2 (5'-TCT CAC AAG CTG CTA GGG GAG TCA-3') as described by Booton et al. . These primers amplified a fragment of approximately 500 bp. The PCR reactions were set up to a final volume of 50 μl, using 30 ng DNA, 1× amplification buffer [10 mM Tris-HCl (pH 9.0), 3.5 mM MgCl2], 2 mM of each dNTP, 20 μM of each primer, 1.25 U Taq DNA polymerase and distilled water to make the volume. Amplification cycles were performed in a GeneAmp System 2700 thermocycler (Applied Biosystems, Foster City, CA, USA). The PCR cycles were set up as follows: pre-denaturation step at 94 °C for 3 min and 35 cycles of denaturation at 94 °C for 30 s, 60 °C of annealing for 30 s and then 72 °C for 1 min, followed by a final elongation step of 72 °C for 5 min. T4 Acanthamoeba strains previously identified at our laboratory were used as a positive control and DNA-free water was used as a negative control. The amplicons were resolved by agarose-gel electrophoresis and visualized using ethidium-bromide. PCR products were purified using a DNA band purification kit (Omega Bio-Tek, Omega, Norcross, GA, USA), according to manufacturer’s instructions, and sequenced in both directions. The sequences of the PCR amplicons were obtained using the ABI PRISM BigDye Terminator Cycle Sequencing kit (Applied Biosystems, Foster City, CA, USA) with 5 pmol of JDP1 and JDP2 primers and a 310 ABI PRISM Genetic Analyzer. The sequences were assembled and edited with ALIGN, EditSeq and MegAlign (DNASTAR, Madison, WI, USA). The Bayesian inference algorithms implemented in MrBayes v.3.0B4 were used to infer phylogenetic trees . A total of 131 related nucleotide sequences of the Rns gene were selected considering an E-value close to zero and percentage identity > 30% . The multiple alignment of the nucleotide sequences was performed in BioEdit and corrected in GeneDoc v.2.7.000 . After including gaps to maximize alignments, the final number of nucleotide positions was 459 bp. For the phylogenetic analysis, we used Acanthamoeba T14 (Acanthamoeba sp. AF333609 and AF333607) genotypes as outgroups, following to phylogenetic tree obtained by Risler et al. . In addition, we included genotypes T5 (A. lenticulata U94741), T2 (Acanthamoeba sp. AB425949; Acanthamoeba polyphaga ATCC30872, AY026244), T10 (A. healyi AF019070; Acanthamoeba sp. GU808320), T11 (A. stevensoni AF019069; Acanthamoeba sp. GU808311), T13 (Acanthamoeba sp. AY102615 and AF132136) and T16 (Acanthamoeba sp. AY026245 and GQ380408). The best-fitting model of nucleotide substitution was selected using the Bayesian information criterion implemented in the program MEGA v.7 [18, 19]. These results gave the best fit for the K2+Γ nucleotide substitution model . We simultaneously executed three parallel MCMC runs, each for 30 × 106 generations with four Markov chains (one cold and three hot chains). Each run was analyzed in Tracer to confirm that effective sample sizes (ESS) were sufficient for all parameters (posterior ESS values > 300) . The nodes were considered supported if posterior probabilities (PP) > 0.95. The trees were visualized using FigTree v.1.1 available at http://tree.bio.ed.ac.uk/software/figtree/ . A total of 114 Acanthamoeba isolates, obtained from 76 patients, were genotyped between 2005–2016. The total number of samples analyzed by culture method during the period, the number of positive samples obtained, the number of samples genotyped, and the gender of the patients in each category, are shown in Table 1. The number of samples available for the analysis per patient ranged from one to four . Forty-nine patients were positive for Acanthamoeba in more than one sample, while 27 patients showed a positive culture only from a single sample (Table 2). The Acanthamoeba isolates included in this study were obtained from both biological material (corneal scrape, biopsies and/or cotton swabs) and contact lens and its paraphernalia (contact lens boxes, lubricant and cleansing liquids). The molecular identification of the Acanthamoeba isolates was confirmed by the detection of the PCR fragment of the expected size for all isolates (423–551 bp). The sequences of the ASA.S1 amplicons obtained in this study have been deposited in the GenBank database (accession numbers are shown in Table 2). By sequencing analysis of the DF3 region, 108 samples from the 73 patients were identified as genotype T4. Five strains from two patients were identified as Acanthamoeba sp. T11, while a single isolate obtained from a patient was identified as T2 genotype (Table 2). The subgenus classification of the T4 isolates was done by the sequence analysis of a 54–69 bp long variable region of the DF3, which revealed the presence of 24 sequence types, herein referred to as T4/A to X. The alignment of a highly variable section of the DF3 fragments showed four new sequence types (T4/L, S, T and U) that have not been previously described (Additional file 1: Table S1). T4/A was the most prevalent sequence type being identified in 41 (38%) samples isolated from 28 (38.4%) patients. Furthermore, this T4/A variant was most frequent among the corneal scrape isolates (19 out of 55 samples, 35.6%). The sequence type T4/B was identified in isolates from 8 patients; the sequence types C and D were obtained from five patients each; sequence types E, F and G were isolated from 4, 3 and 6 patients, respectively; sequence types H, M and U were found in samples from 2 patients each; while the remaining sequence types were identified in isolates from individual patients. Most of the samples obtained from the same patient had the same type of T4 variant; however, in five cases (patient IDs: 54, 57, 58, 72 and 76) the samples presented different variants. A total of 128 samples were included in this analysis (114 isolates obtained in this study and 14 reference strains; see methods). The phylogenetic tree constructed considering the partial sequence of the Rns gene (Fig. 1) was consistent with previous reports . The tree showed well-supported clusters for each of the genotypes (PP ≥ 0.95). The sequences from patient samples used in this study were clustered according to genotypes T2 (n = 1), T11 (n = 5), and T4 (n = 108). In relation to T4 genotype, the phylogenetic tree recovered three groups, two of them were well supported. The first group was weakly supported (PP = 0.52) and included the variants T4/C, D, I, L and Q. The second group (PP = 0.95) included variants T4H, J, O, P, R, T and U. Finally, the third group (PP = 0.95) included variants T4A, B, E, F, G, K, M, N, S, V, W and X. We genotyped 69.1% of the Acanthamoeba strains isolated at the ISPCh between 2005 and 2016, while the rest failed to revive after freezing. T4 was the predominant genotype found in Chilean isolates (73 out of 76 patients), as reported worldwide [10, 12, 17, 22–24]. T4 is also the predominant genotype in environmental samples, followed by T5, both in Chile and other countries [9, 25, 26]. None of our clinical isolates corresponded to genotype T5, further corroborating the observation that this genotype is clearly underrepresented in AK cases . In three other patients, T2 and T11 genotypes were found. Contrary to T4, these genotypes have rarely been found associated with AK [12, 27–30]. Furthermore, in South America, genotype T11 has previously been reported only from the environmental samples, so this is the first report of this genotype being isolated from AK patients; it is also the first report of genotype T2 circulating in this area [26, 31–33]. It is worth mentioning that the sequences of genotype T11 reported from the environmental strains in Chile are different from those isolated from AK patients . Among T4 isolates, 24 different DF3 sequence types from 108 isolates were identified in this study, herein referred to as T4/A to X. When comparing our DF3 sequences with those isolated from the environmental sources in a sole study of this type performed in Chile, only 3 out of 13 environmental sequences were the same as of ours . This finding suggests the existence of different degrees of virulence among genotype T4 strains, which warrants further investigation. Of our DF sequences, 38% belonged to the T4/A variant; the finding of this sequence variant as the most prevalent in Chile differs from that reported in other countries [10, 13, 22, 34]. Many of the remaining DF3 variants have previously been reported in more than 10 countries (T4E, F, G, I, N, O and V), while others have been reported in few countries, of even are described here for the first time. These data suggest the predominant worldwide distribution of some variants, along with some minor variants having a highly low distribution and, perhaps, weaker pathogenic properties. The Bayesian inference analysis further supports this classification, since most of the predominant and widely distributed variants were clustered together. Further studies should be conducted in order to elucidate what makes some variants more pathogenic than others. This information would also be valuable in order to select suitable strains for antigen production and development of diagnostic methods. Finally, in most cases where more than one sample was available for culture, the same DF3 allele was isolated from all of them, following other authors . In discordant cases (5 out of 27), it is possible to assume that the infecting variant is the one found in the corneal scrape or the biopsy. In that sense, patient no. 72 was a particular case, providing different DF3 sequences between two corneal scrapes taken from the same eye, suggesting a truly mixed infection. Unfortunately, the low number of patients showing different variants precludes the analysis of a possible correlation between source and variant, which could provide an approximation of the real pathogenic potential of the different variants isolated. We report for the first time the genotypes of AK causing strains circulating in Chile, obtained between 2005 and 2016. Chilean AK isolates were genotyped as T2, T4, and T11. 24 DF3 variants were identified within the predominant genotype T4. The Bayesian inference analysis showed that Chilean most prevalent T4 sub-genotypes, which have also been reported worldwide, formed a separate cluster of the minority or “local” T4 variants. This study provides useful information about the predominant genotypes and subgenotypes that would be useful in selecting suitable strains to develop immunological and/or molecular diagnostic assays in Chile. We thank all members of the Parasitology and Molecular Genetics laboratories for their collaboration in the confirmation of AK diagnosis. We would like to specifically thank Daniela Liempi, Daniel Escobar, Armin Araya, Alan Oyarce, María Paz Alwyn and María Ibáñez Arabena who were in charge of the routine laboratory diagnosis. We also thank all professionals from the hospitals and health centers that contributed to the specimen collection; without them, this study would not have been possible. This research did not receive any specific grant form funding agencies in the public, commercial, or not-for-profit sectors. Essential data are presented in the main text of the paper. Nucleotide sequence data of the isolates of Acanthamoeba spp. obtained from the patients of AK have been submitted to the GenBank database under accession numbers as given in Table 2. MIJ conceived the original idea, supervised the laboratory techniques for AK diagnosis, analyzed and interpreted the data and was a major contributor in writing the manuscript. CA and JL performed the laboratory techniques for Acanthamoeba genotyping. CA was also a major contributor in writing the manuscript. MS-C performed the phylogenetic analysis, analyzed and interpreted the data and was a major contributor in writing the manuscript. LM analyzed and interpreted the data and was a major contributor in writing the manuscript. SMC analyzed and interpreted the data and revised the manuscript critically for important intellectual content. AO revised the manuscript critically for important intellectual content. JF conceived of the original idea, supervised the laboratory techniques for Acanthamoeba genotyping, analyzed and interpreted the data and was a major contributor in writing the manuscript. All authors read and approved the final manuscript. MIJ holds a PhD in Fundamental Biology and Systems and is the Head of the Parasitology Section of the Public Health Institute of Chile. CA and JL are laboratory technicians with more than three years of experience. MSC holds a PhD in Ecology and Evolutive Biology and is Assistant Professor of Bioinformatics and Molecular Biology at the Universidad Bernardo O’Higgins. LM holds a PhD in Microbiology and is Assistant Professor of Microbiology and Parasitology at the Universidad Autónoma de Chile. SMC holds a PhD in Microbiology and is a Research Professor at Universidad de los Andes. AO holds a PhD in Biological Sciences and is the Head of the University Biotechnology Institute of the Universidad de Granada. JF holds a PhD in Molecular Biology and is the Head of the Subdepartment of Molecular Genetics of the Public Health Institute of Chile. This research was approved by the Ethics Committee of the ISPCh (Santiago, Chile) and adhered to the tenets of the Declaration of Helsinki. Consent to participate was not applicable. Muiño L, Rodrigo D, Villegas R, Romero P, Peredo DE, Vargas RA, et al. Effectiveness of sampling methods employed for Acanthamoeba keratitis diagnosis by culture. Int Ophthalmol. 2018. https://doi.org/10.1007/s10792%2D018%2D0958%2D3.